Gionee F103 Reviews, Specification, Best deals, Price and Coupons. 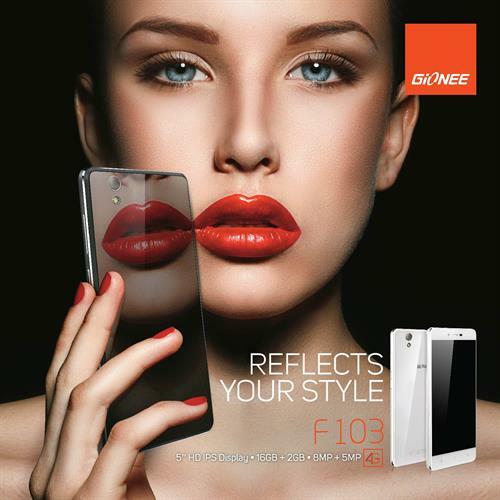 Gionee's F103 is part of their lifestyle series (F-Series) smartphones. This phone features dual mode which supports CDMA and GSM. It is powered by 1.3Ghz Quadcore processor and chipset is Mediatek MT6735. GPU is Mali-T720 GPU which is good for gaming and lag free performance. This phone also supports 4G LTE connectivity and has a 2GB RAM and 16GB internal storage expandable up to 32GB through external memory card. It has a 5.0 inch HD IPS Dragontrail Display with scratch protection. The phone has dual cameras. The rear camera is a 8 MP camera which has a variety of features like HDR mode, panorama, Geo-tagging and has LED Flash.The front camera is 5 MP with HD recording supported. The battery is 2400mAh which is good enough for a mid range smartphone like this phone. It supports GPS WiFi, Bluetooth and microUSB port. F103 is powered by Android 5.0 Lollipop with Gionee's customized Amigo 3.0 UI. It supports OTG which comes handy when you work with different smart devices and PC. Write reviews about Gionee F103 and make money! Add photos of Gionee F103 and make money!